Genuinely Human. That's what your elearning projects will sound like when narrated by me. I'll keep your listeners engaged and feeling like they're getting information from a friend and learning from their favorite teacher. 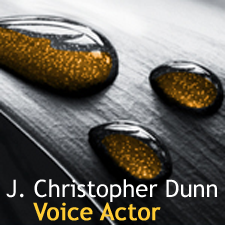 J. Christopher Dunn (Chris) is a non-union voice actor in Seattle with a versatile vocal range and experience with creating voiceover and narration for commercial, corporate and technical clients. His training background includes character development and voice acting, and he's delivered confident and genuinely human sounding voiceovers for over a decade by combining his understanding of audio technology and ability to assess and understand scripts quickly. His resume includes voiceover work for commercials, instructional tutorials, telephone systems, and documentaries for clients such as Microsoft, Phillips, and MillerCoors. Chris recently recorded thousands of phrases for VocalID, a cutting edge company working on delivering unique voices to vocally challenged people. His past audio experience includes production and voice acting on commercials and radio dramas and as an actor in stage performances. Chris provides fast turnaround of auditions and finished projects with his professional personal recording studio.